Spray Bonide All-Season Spray on hemlocks to control woolly adelgid. 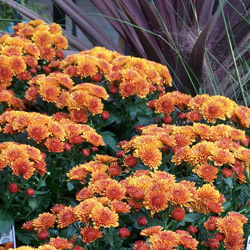 Spruce up the landscape by planting Fall Pansies, Flowering Cabbage & Kale, Garden Mums, Fall-Blooming Perennials as well as Trees and Shrubs. Test your lawn pH to determine if you need to apply lime this season. A 5o lb. bag of Lime will raise the pH about a half a point per 1000 square feet of turf. Pick up your Spring Flowering Bulbs like tulips, daffodils, crocus, hyacinths, snowdrops and more! An Auger for the drill will also help make planting easier. Plant cool-season salad greens (arugula, corn salad, lettuce, radishes and spinach) in cold frames. Apply Superphosphate now to coax stubborn plants into bloom next year. Aerate, re-seed and apply Fall Lawn Food to the lawn. Keep grass seed damp; water every day if necessary. You will also want to check for grubs. Increased activities of skunks, raccoons and moles as well as brown patches that peel back easily are an indication of grub activity. Apply granular Sevin to control the grubs as well as chinch bugs and sod webworm. Treat houseplants with Systemic Granules and Concern Insect Killing Soap now to get rid of any insects before bringing them into the house prior to the first frost. Clean out garden ponds and pools. Cover with Pond Netting before the leaves start falling. Plant bulbs. Fertilize with Espoma Bulb-Tone and water in well. Divide daylilies and spring-blooming perennials, including iris and peonies. Don’t be tempted to prune your spring flowering shrubs like forsythia, azaleas, camellia, holly, lilac, rhododendron, spirea or viburnum or you will destroy next year’s buds. 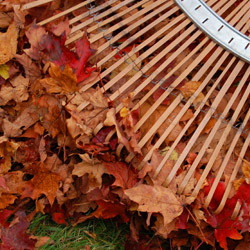 Rake leaves from the lawn and lower the mower blade. Check your compost pile. Now is a good time to add Concern Bio Activator to help break down brown leaves and lawn clippings. Dig up summer-flowering bulbs, such as dahlias, cannas, tuberous begonias, caladiums and gladiolus after the frost kills the top growth. 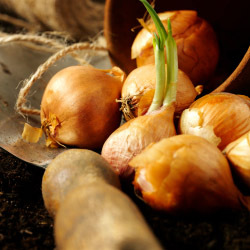 Treat them with Bulb Dust, pack them in Peat Moss, and store them in a ventilated area for winter. Fertilize your trees with Jobes Tree Spikes after the leaves fall. Fertilize azaleas, rhododendron, and evergreens with Holly-Tone and other shrubs with Plant-Tone. Spray hemlock again with Bonide All-Season Spray Oil. 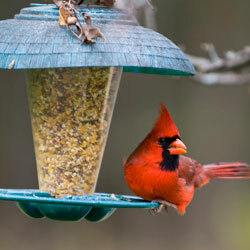 Set up bird feeders. Clean out birdbaths, refill and purchase heaters for the winter. Clean up and destroy diseased rose leaves and debris surrounding shrubs and perennials. Mound 10-12 inches of dirt around roses to protect from winter damage. After the ground freezes, cover roses with mulch or straw. Remove annuals, roots and all, and add to your compost pile, but do not add any diseased material to it. Cut back perennials unless they feature ornamental seed heads and Fertilize with 5-10-5. Prune long raspberry and rose canes back to a height of three feet. Clean up your beds and gardens to avoid harboring insects and diseases over the winter. Pot hardy spring bulbs (anemone, crocus, daffodil, hyacinth, ranunculus and tulip) and place in a cold frame or cool garage (40 degrees) or sink into the ground and mulch. Keep evenly moist. Update garden records, noting successes and failures, gaps in planting, future planting and landscape changes. Spray evergreens, azaleas, rhododendron, boxwood and rose canes with Wilt Pruf for protection against wind and cold weather.